Since you are student and have ISIC card you can get the 15% discount on www.bilesuserviss.lv. The usual gift card costs 15 Ls and it is valid for participation of two persons in one roll down simultaneously. - Open zorbings in Riga are available starting from the first (+15˚C) and dry Saturday of the spring and ends with September’s slush. - Zorbing is waiting for you on Dzeguzkalns after the start of the season. - Please call +371 29535888 before you go. 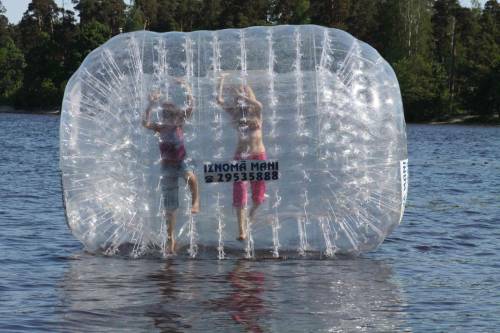 - Or organize the сustom zorbing for your party. • The weight of a person riding the zorb should not exceed 100 kg. • Zorb roll-downs are not recommended for pregnants, persons with heart insufficiency or with the following diagnozes:: epilepcy, sugar diabetes, osteoporosys. 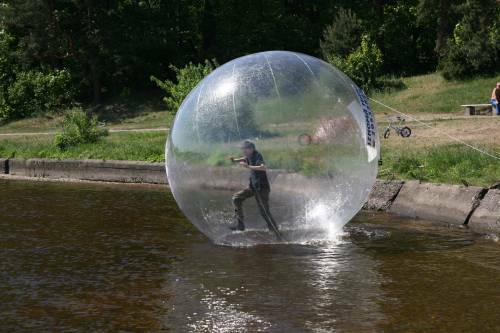 • A person riding a zorb should be older than 18 years old (under-age persons should be accompanied by parents). • We strongly reccomend not to roll down if you suffered injuries recently. • Due to bad weather zorb roll downs can be delayed (regardless of the time of the year). In this case we will offer you another date that is convinient for you. To roll down the hill inside zorb ball in Riga, you should buy a gift card on the sites of event agencies: www.davanuserviss.lv, www.davanugrupa.lv, www.zemenitessniega.lv.